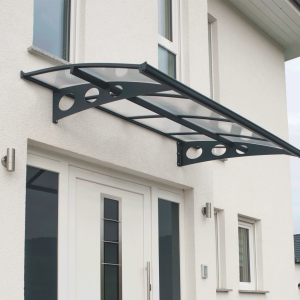 The Walbrook Overdoor Canopy is a modern, elegant addition to your home. 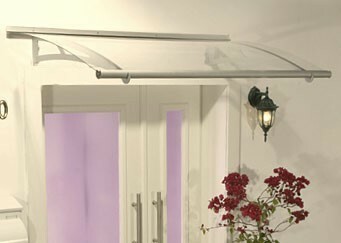 It provides your door or entrance way with a generous sheltered area. 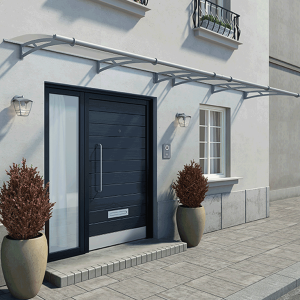 This sleek over door canopy is manufactured with high quality laser-cut steel arms and an integrated rust resistant aluminium rain gutter. The roof is glazed with UV protected clear polycarbonate panels giving you protection from the sun and rain. The canopy comes with the complete wall mounting kit including the back sealing gasket. 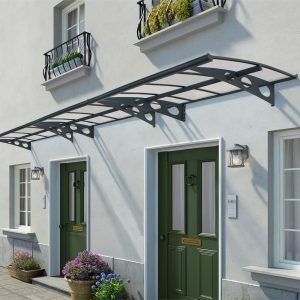 The Walbrook 1500 Overdoor Canopy is suitable for a single door entrance, covering an area of 1.4m2. 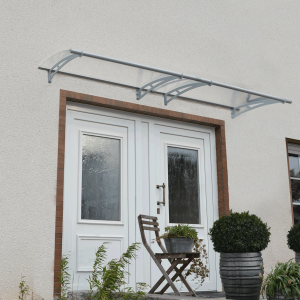 The polycarbonate roof panels are virtually unbreakable and the aluminium frame and guttering are rust resistant so this over door canopy is built to withstand any weather all year round. Easy DIY assembly – smart and fast locking assembly system, no special tools required. Click here to download our Walbrook 1.5m assembly instructions.